Subject: BRINGING YOU UP TO DATE!! I'm still in a state of shock since lucking onto your amazing website. I have been able to contact an old friend Ken Davie in the States. He said in his e-mail that you have done a wonderful job and I agree with him. He was delighted to hear from me and also gave me the phone number of our mutual friend Bob Davies. We three enjoyed the occasional night out - last century. I phoned him up and he has invited me down to his property in Kent on Sunday when he will be holding his own airshow.I kid you not.It seems he has his own International business,with his own airstrip and three aircraft at the last count, according to Ken. I have lived in Bermondsey, South London, for the last 22 years and before that a few years in Liverpool. I married my second wife in 1975 and we have three kids....all grown up now. My eldest lad, Bobby (of course), lives in Gothenburg, Sweden and is married to a Swedish girl. He is over for a visit at the moment,which is great.Terry and Nicola are my 21 year old twins who still live at home. I work in a law firm in the city, near St.Pauls. No, not a lawyer, basic clerical stuff really. I look after the legal papers, which are all computerised. I keep track of them etc., boring stuff. In the late 1980's I was at the University of North London for a couple of years on a Teacher Training/Degree course. I passed the teacher training bit but did not complete the degree. I was mini-cabbing at night to supplement the grant, young family to support, and it was killing me, so I jacked the course in and got a job with steady wages. I hated being in the classroom anyway during my training, I was more of a referee than a teacher. It was a rough inner city school and most of my time was taken up with stopping the little bastards from killing eachother. I have no regrets whatsoever and still get a warm glow walking past the cab office, knowing I don't have to do it anymore. My computer at home has crashed but I'll sort it out soon, at the moment I'm restricted to to the one hour lunch break at work. This is such a long message that I may not have time to sign on as a member but I will as soon as possible. I'm due back at the coalface in a few minutes so I'll wrap this up. I can't tell you how chuffed I am at all this happening Tony. It was brilliant to hear from you and to see so many familiar faces and sights. I still can't quite believe it. I hope you are well, best wishes to you and I hope to hear from you soon. Subject: Re: Here's one for you! By a coincidence, that picture has also come to me. Perhaps it's not such a coincidence as it has obviously just come to light and there is the realisation that there might be some interest in it. Anthony, Wg Cdr Betts (OC Ops), 'Tricky Dicky' Kent (OC Stores/Movements), Phil Mann (Ops Officer) Jock Barry (Armourer) Jim Marchant (UKMAMS), 'Thumbs up' Taylor. I'm going to work on a better identification and I'll keep you informed. The photo was taken at Decimomannu in 1974. Spent today, Friday, at RAF Shawbury just down the road. Had an invite to the Families Special Open day which is held every year. A pal of mine who works there in the MU where they upgrade and service aircraft took me on a tour of his work area. Here they are at the moment preparing a load of Gazelles and about 60 Bulldogs for the next MOD auction to be held in October; also the ex Queen's Flight Wessex XV733. So if you’ve got a spare £5000 you can get a Bulldog in full working order. The usual display in the afternoon, two Apaches, a C130 with the Falcon parachute team, and of course the usual superb display by the Red Arrows. Something I’ve never seen before at an airshow was a Sqd/Ldr helicoptor pilot with his own quite large OO model railroad, he was happily playing, sorry demonstrating it, set up in room in the Air Traffic Control simulator room and told us he takes it wherever he gets posted and they always find a spare room for him to play, sorry, display it. We are all boys at heart, even Sqn Ldrs! Come on Tony - give us a hard one! Please see my new e-mail address. I've just heard that Guinea Hunter has just won the big race and I had £20.00 each way, so I will be having a few beers tonight! I am not sure if it's Lusaka or Dar Es Salaam. It's the pallets in the background that have thrown me. Names as follows, left to right: Flt Sgt Ray Marks, SAC Fagin Donaghy and SAC Gibby Gibson. I am the one in the background watching the bridging plates, they were liable to fall off as we couldn't get the pins. It wasn't me! I was up on the flight desk at the time!! Loading/unloading a Houchin (48KVa or 24KVa) and the chap on the towbar fell asleep? Location is tricky, possibly Akrotiri or somewhere just as hot judging by chap in KD's. Hangar door unusual shape. Give in! Give me some more cabbagy aircraft ones! I went there on sort of my Swansong with Ian Berry and Pinky Salmon around '95 ish. Unless Orion's are a red herring and it's Belize (never been there)! I'll give a quick run through of my service career. I joined in Jan '84 and was on No 50 Operator's Course. I was posted to Northolt and in Nov '86 attended No 80 Controller's Course, the one that went from 12 to 5 after the pre-course test! In Oct '87 I was detached to ASI and on my return I was posted to the MSF at Wittering. In March '91, I joined 4624 Sqn until I moved back to Ireland. I will have to dig out some of my photos and send them on to you. Talking of contributions... Ian Berry has outdone himself with his "new" scanner these last couple of weeks, and sent in about 40 new photographs which are spread around all of the decades - there are some really nice pictures of the Beverley at Abingdon and Labuan - classics. Ian also provided a beautiful article about Operation Agricola, with some fabulous photographs of the helicopter operations etc., well worth having a looksee. Finally, Ian, again (Bless 'im) gave me permission to put up his article entitled "Another Time - Another Place" which tells of his escapades for the years 1972 - 1982 on UKMAMS - quite the story! I still have some more photographs to work some "Webbie Magic" on to go into the article, but for all intents and purposes it's up there. Now here's a shocker - there is a surprise photograph "buried" in the Images 2000 pages of a young Ian Berry that he hasn't even seen himself yet (if he had seen it I am sure he would have let me know!). Just take the "tour" through the photographs on that page and you will find it - it's a delight! When I came into work this morning I was delighted to find an email from Dave Breckon and another from John Philps. You were right about people getting in touch - I'm not quite sure how they did as I don't see my name anywhere on your website and the mystery photo I was in has gone, perhaps they found it last week. I had a great day at Bob Davies' place. He picked me up from Ashford station in his Bentley and drove me up to his property, which was massive. He owns three planes, one of which is a P51 Mustang. He really threw it around the sky during the display. He was also the lead plane in a formation of four Harvards. In all, he flew four times. He introduced me to one of his friends and the three of us wandered about for a while before the show. Imagine my surprise when I found out later that that this mate in the jeans and T-shirt was Air Marshall Cliff Spink, who is the boss in Saudi. He later flew a jet trainer called a T-Bird in the display and was amazing. Two years ago Bob was awarded the MBE for services to the defence industry. He is a very rich and powerful man but I can still see the old Bob that we both knew and he is keen to stay in touch. Have to shoot off now old friend, work beckons. I hope this e-mail finds you in good health. Am just getting used to a new system, the other computer had insufficient memory - like me. I well remember the task at Odiham, or was it Benson? If my memory serves me right I was on standby and just happened to be in the Ops Room when the task came in (did not want to miss a good one!) and the clerks were wondering who to call in for the job. Having done quite a number of Wessex into Belfast jobs in the past and always found them a challenging and rewarding task, volunteered myself and any others that were around, to take on the job. Again I think there was only myself and perhaps one other who had done this load and ended up going along with seven others in two Landrovers and with all the usual paraphernalia, tirfor, chocks, dunnage, saw etc. The aircraft arrived with the four Wessex lined up ready for loading. The JATE TDS was kept to as far as possible allowing for u/s floor points etc., and all the other items which were not accounted for on the TDS such as the chain box! Amazingly all went very well. The normal time given for one aircraft was four hours and if my memory is right, we did the two in under four hours. The crew were only taking the aircraft back to Brize where there was some 'do' on in the mess and were agitating for a QTR which they certainly got. The ALM's were particularly vigilant knowing they would have to hand the load over which did not help us during loading, and we frequently had to explain that some things were not possible. Anyway I thought we had done a good job but nevertheless got no thanks for the QTR and once back at base I claimed a 'record' for the eight man team. Yes it was a 'drive-drive' job and anyone who has done this task well knows that there are so many things that can go wrong. Hope my facts are correct but I do stand correcting. I read the article re 194 accident at Tromso which I found most interesting but once again with finger trouble, and wiped it off the screen. I do well remember the incident but not all the outcome. To put the record straight 'F Troop' were at Bardufoss when this happened, not at Tromso. I well remember the only injury was a broken finger but I did hear from wherever that one of the findings of. the enquiry was that one of the problems had been the aircraft captain just happened to be very short in stature and was unable to make full use of the foot controls whatever they may be. Perhaps someone can enlighten me. Had our usual Thursday night out down the local with my friend from Shawbury (Ex Seletar A.S.F.) He brought in a copy of an article from ‘Airclues 2000’ of Sierra Leone Operation Palliser. It’s written by a Flt Lt Ellie Pook UKMAMS Lyneham and it’s a three page article so I’ll snail mail you a copy tomorrow. Also got a ‘little’ personal article on my trip to and from Aussie which I’ll send to you at the weekend. I must say your website is looking better than ever. I am still looking for that book but so far with no result. It will probably appear when I am not looking for it! I have less time than ever these days as I recently returned to work after 18 months on disability, so what with full time employment as well as helping Wendy with the antiques business I have a very full life again. Anyway, by way of an alternative contribution, I am offering the attached little story that I had put together for a business colleague after he had heard me relate it. It really is the truth. Please feel free to do what you want with it including discarding it if you don't feel that you can use it. This is a true story. Not all of us have such striking life lessons and I am thankful that this happened to me. Although at the time, "wild horses" would not have persuaded me to the truth; as I grow older, I find myself telling and re-telling this incident as a joke against myself and also because, at the time, I advanced several years in experience in a matter of seconds. ….. It is a lesson that I have never forgotten. It is fairly common knowledge that the true "day-to-day" running of any military organization, regardless of what outsiders may think or perceive, is carried out by that shrewd and experienced sage - the Senior NCO. Staff Officers may make policy, Junior Officers think that they give orders but nothing actually gets done without the involvement of the SNCO. The Royal Air Force is no exception to this reality. I was commissioned at the ripe old age of 18 as " ACTING Pilot Officer" and it was with this exulted rank that I was first posted to Flying Training School at RAF Syerston. God knows what any of the SNCO's at that station must have thought when they saw me, I don't think I even had to shave each day at that time! The fact that years later, in my early twenty's, I was known amongst other things as "baby face" will give you a clue as to my appearance. I should have started learning then how unimportant I was in comparison to those experienced men. God even tried to give me a fair start when one day I was smartly put in my place with an admonishment from the Station Warrant Officer after having failed to notice and return his salute from the far side of the parade square! "Excuse me Sir! But I was saluting you!!!!!" - - yelled at 1,000 decibels for all to hear. Government economics dictated that I was not to stay at the front end of the aeroplane. (It was cheaper to change me than the undercarriage every third landing!) So it was that I found myself 18 months later as Equipment Officer on 5004 Airfield Construction Squadron at Khormaksar in the Gulf of Aden. Here God tried again, on my behalf, to impress upon me the insignificance of my position in comparison to those men who got things done. Every morning the Equipment Flight Sergeant placed a large pile of papers and forms on my desk, each one was marked with a red cross on it. "Please Sir, sign each piece of paper next to the red cross, but DON'T bother to read them!" 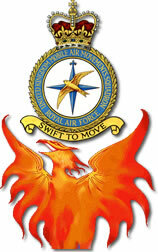 Following a serious injury in the gulf that kept me in hospital for over a year, I was posted to RAF Abingdon. By now I had reached the even more exulted rank of "Flying Officer", I had been commissioned for three years and I was twenty-one years old! My SD cap was faded by the heat of the tropical sun and there were no flies on me! I'd been around a bit and I knew about those wily SNCO's. Prior to my transfer to UKMAMS, I spent a year as a shift Movements Officer on the Station Movements Flight and it was here that the subject incident occurred. I had been put on a special detachment at a nearby RAF Station for several days. This required me to sign out a Land Rover from the Station MT Section each day of the detachment. Now the MT Sergeant was a particularly hairy-arsed sage with no great love for junior officers who were still wet behind the ears. This, I should have sensed if I had any sense in me. On the first day I signed out a vehicle that was rife with problems, the brakes were poor, the wipers had a fault etc. etc. In the evening, upon returning the vehicle, I sought out the MT Sergeant and in no uncertain terms and with the full authority of my exulted rank I told him what I thought about his sorry vehicle. Furthermore, I insisted, I did not expect to receive the same vehicle on the next day or there would be trouble for him! With due deference and a sort of choked expression the MT Sergeant assured me that I would not get the same beast tomorrow. Early next morning, I was astonished to perceive that the vehicle waiting for me was the same one as yesterday. How did I know this? Well of course the RAF puts reference marks on everything that moves and a lot of things that don't move as well. The reference mark on the side of this particular Land Rover was the same one as yesterday, you couldn't fool me. This Sergeant wasn't going to get away with this!! I stormed into the MT Sergeants office and in a loud voice indicated my displeasure at his failure to comply with my orders. He looked genuinely surprised and assured me that this was indeed a different vehicle from yesterday. Did he think I was stupid? "Come outside with me", I told him, "and I'll show you how I know you're trying to pull the wool over my eyes". We walked over to the vehicle where I indignantly pointed to the tell tale reference mark just above the left wheel. "See Sergeant - there it is - TP25!!!" With a quiet smile the MT Sergeant looked at me and said "Yes Sir, Tyre Pressure 25!"